My last ‘models based approached to PE’ showed how we had implemented Sport Education into our KS4 Curriculum with a particular focus on developing student leadership. 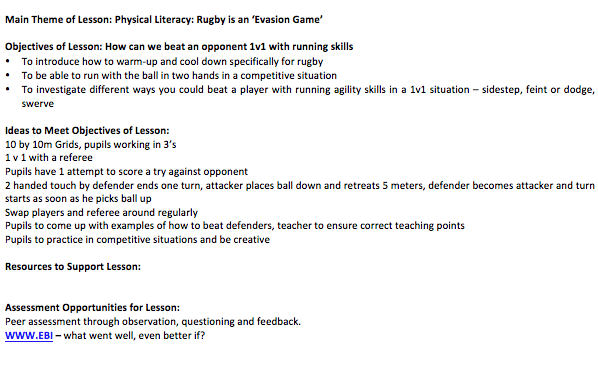 This post will focus on showing how we have implemented a Teaching Games for Understanding approach to introducing Year 7s to rugby. Why did we adopt a TGfU? In some ways I’m very lucky at the school I’m at. One main reason is the time given to PE at Year 7. We have 4 hours timetabled lessons a week and frankly, no offence to my Primary School colleagues, but they desperately need it. Our Year 7 curriculum isn’t very broad, we tend to go deeper in our major sports of rugby, football and cricket that we play competitively. (Don’t worry they also get gymnastics, dance, swimming, badminton, Health Related Exercise and athletics as well!) We try to build physical literacy through playing these three main sports. 2 years ago whilst I was watching my department teaching rugby to the whole of Year 7, something struck me as very wrong. I saw scores of boys stationary, waiting their turn for a drill. Which they practiced once, ultimately failed because of their poorly developed motor skills, then plod to the back of the queue to spend more time waiting. This approach to teaching them rugby (or any sport) had to change. They needed to be more active, they needed to have the ball in their hands more, they need more time practising, they needed more time playing and they needed to develop better game sense. It is down to the individual teacher how to get the students to this point, and it is a high expectation considering 95% of our students have never played any form of rugby before, let alone contact rugby. We now all follow a Teaching Games for Understanding approach, focusing on basic attacking skills and principles in a touch environment, before introducing contact to them and then focusing on tackling, rucking and mauling and basic defensive principles. Students are a lot more active more of the time – last lesson after the warm-up I had 45 minutes teaching time. Students were engage in playing rugby for 39 minutes of that, either through playing, having 1 to 1 sessions with me, refereeing or talking about decisions or tactics. The other 6 minutes was teacher talk led by myself. They have a lot more time in game on the ball, and probably a lot more time practising the skill, but I would need data to back that up. The quality of the conversations between myself and students has improved. We talk about ‘creating space’, ‘making the right decisions’ and ‘selecting the right skills’. Previously I would find myself getting frustrated that I was spending my time teaching the drill and not the skills. Asking them to referee small sided games, right from the very first lesson, has greatly improved their understanding of the game. Understanding the laws allows them to try and exploit them in a game! Although I am interested in moving away from a curriculum of doing, to one of knowing, the students are obviously working hard because of the competitive element of the games. They are out of breath and have sweat on their faces at the end of lessons, much more than in my traditional approach. I feel there is a lot more enjoyment in this approach. Usually we get 20 to 30% of Year 7s attending after school rugby club. This year we have had over 50% of boys attend at least 3 after school sessions and this number is rising. If we had the staffing we could easily run 3 competitive Year 7 teams. I can only assume this is down to our approach in lessons. Being able to reduce and introduce rules as I see fit, allows students to focus on improving one or two areas. 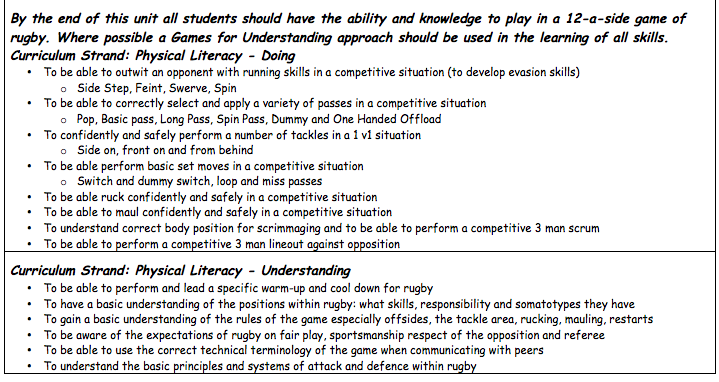 In an incredible complex game life rugby, decision making is as much key as physical ability and technical ability. Reducing the amount of decisions students need to can allow them to develop technical ability. I found this when increased the size of the playing area. More space probably meant more decisions, therefore the quality of the game and the skills dropped. When I repeated the same game at the beginning of the next lesson, the quality and skill level had improved once again, perhaps meaning that experience is a key driver for learning. From our grading (which I have issue with as I think its highly subjective in PE) there has been no recognisable improvement in skill level between the two different approaches. However what is clear is engagement, motivation and enjoyment has definitely improved. If our key aim as Physical Educators is to develop a life long evolvement in physical activity and sport and not produce elite athletes, then perhaps a TGfU might be something to investigate further. This year we have added a couple of support measures to this approach we think are working quite well, but will need to review at the end of the unit of work. Firstly there is the 1 to 1 support or team support. As students are playing their games and there is a referee you are able to take a student out and work on a specific skill with him. For example If I see a student who is unable to pass very well, I take them out of the game, and do an intensive session with him. This takes the form of 2 minutes of continuous passing with me, with me giving immediate verbal feedback. This impact this has been incredible. How often would a student pass a ball in a whole lesson? We can manage about 50 practise passes in 2 minutes, then they are back into the game. 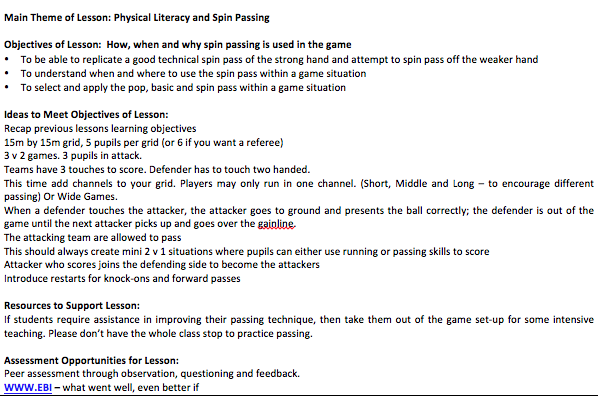 This can be done with a small team, very quickly, whilst the rest of the class continues their games and refereeing. Yes it is a drill, but is done so the specific student or group can receive specific attention, not the whole class. We do this in a working area that is set up outside the playing areas and in a position where the teacher can teach and also supervise the games. Secondly we record play between teams on iPads and them upload them to our class pages on Edmodo. We ask students to go home and view the game play and pick out skills that other students had performed well and why they were successful. Ive also used clips to show common errors, such as lack of depth or support, to my class, and highlight them in the post on Edmodo. They have begun to post their responses online at home and refer to them at the beginning and end of lessons. Please leave a comment. As always I want to hear from other PE teachers with regards to their approaches, to challenge my approach and for us to improve our practice. You can email me at imsporticus@hotmail.com or follow me on twitter @ImSporticus. Look forward to hearing from you. 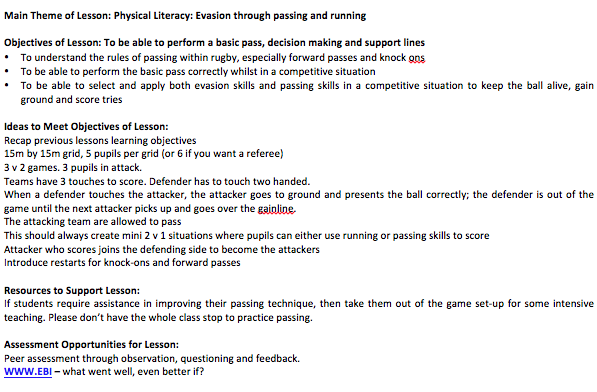 A great approach to teaching rugby and one that I’ve used myself. I think that the TGfU approach works but how are the other staff engaging with it? I used to use a lot of rugby league when I was teaching the student and only introduce rugby union when they were developmentally ready. I think that readiness is important and some of the bigger skills of rugby (like scrums, rucks and mauls) can get in the way of tactical understanding. I know that some of your players need to understand these for match play but modification can be a really key unlocking player understanding. Good luck with these endeavours and let us know how it goes. Reblogged this on Dip and Swerve. Thanks for sharing this approach. Can I ask why did you go from 1v1 and 2v2 to 3v2? Did you ever go back to 2v1 or work on changing the space or the objective for the boys? Just curious. Personally I do change things. 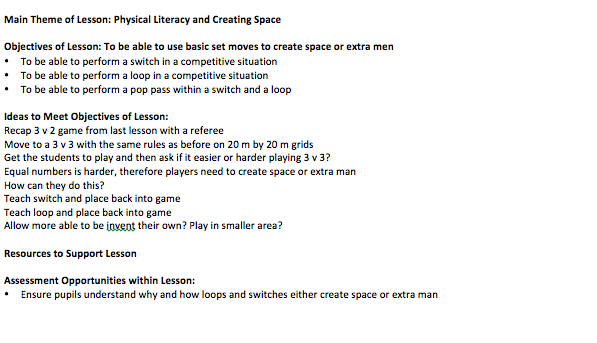 Within my lessons I will have pupils playing (and officiating) different games, with different conditions, depending on where they are in their development/learning/progress. Rugby is an activity I feel comfortable doing this and it works well. Nick Hill, whose resource I shared with you, would challenge this approach as not a true TGfU approach but a SSG approach. He would introduce playing rugby 12 v 12 to children with very few rules (enough to ensure safety) and build up that way. He would then use the games I have suggested as ‘interventions’ if and when the children might require them based on his observations. This approach would really take me out of my comfort zone but is something I am considering trying this upcoming year (If I am brave enough). This is a nice example of gane-based teaching. Thank you for sharing, and for also providing the update of developments this year. I would really like you to think of writing this up into an article and sharing it via ACHPERs Active&Healthy Magazine. Contact the editor @baldyr55. I would be happy to help if required. Thanks for taking the time to comment Shane. I have been in the process of redrafting this, is there anything you feel needs to be added? Next Post A day in the life of a Dosser.